The effects and symptoms of pneumonia can be scary enough, but add inflammation of the bronchioles, and your infection has jumped to the next level. Bronchopneumonia is seen when an upper respiratory tract infection spreads to the lower respiratory tract. Because this potentially life-threatening condition can cause an interruption in your breathing, we will focus on the bronchopneumonia treatment. Is bronchial pneumonia contagious? Read on to find out. Bronchopneumonia can also fall under the names of bronchial pneumonia and bronchogenic pneumonia. It affects the lungs as well as the bronchioles, which are the air pathways to the lungs. As a more severe form of pneumonia, bronchopneumonia demands immediate treatment. There are several factors that can put you at high risk for contracting such a condition as bronchial pneumonia. Young children under the age of two years and adults over the age of 65 are susceptible to this form of pneumonia. The symptoms and related complications can be more severe than to those outside of these age groups. Having bad habits such as tobacco use and excessive alcohol use can increase your chances for bronchial pneumonia as the immune system can be compromised with these activities. Following a poor nutrition diet can also lead to infection. If you work, volunteer, or frequent hospital or nursing home settings, you could be putting your health at risk for contracting bronchial pneumonia. Existing health conditions can create an internal environment vulnerable to disease and infection such as bronchopneumonia. These may include chronic lung diseases, heart disease, diabetes, acquired immunodeficiency syndrome (AIDS), human immunodeficiency virus (HIV), or an autoimmune disease. Having difficulty swallowing, a chronic cough, or dependence on a ventilator to breath can also increase your chances. 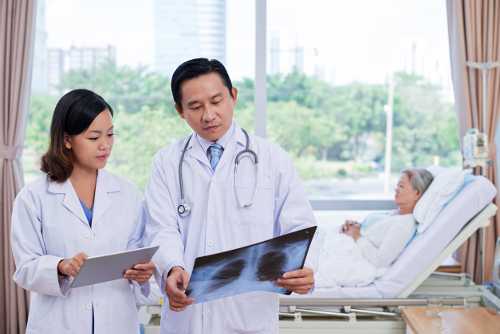 For a proper diagnosis, a medical team will use various diagnostic tools. A physical examination and your past medical history will be the prime focus at your doctor’s visit. Your breathing will be checked for any abnormal sounds, including wheezing. You can expect further testing as your symptoms may mimic other lung conditions such as asthma and bronchitis. An X-ray will uncover bronchial pneumonia existence as patches on the film. It will show in the bottom of both lungs. Known as a CBC, this blood test will detect a high number of white blood cells with the infection. An examination of a blood or sputum culture taken from the patient can identify the type of bacterial organism. A CT scan allows an in-depth look at the lungs. This test looks for infection and disease by taking a sample of the tissue within the lung. It also allows the doctor to take a closer look at the airways. Measuring the oxygen level in the bloodstream helps to diagnose the severity of the bronchopneumonia. Most cases of bronchial pneumonia require medical and home treatment. Antibiotics are used to fight bacterial infections. The few cases of viral infections usually heal on their own with rest. Severe viral infections may need antiviral medication to reduce symptoms and increase healing time. Bronchial pneumonia treatment for young children differs from the above described options, as their immune systems may not be fully developed or strong enough to fight the infection. Many cases at these ages will be treated in the hospital with intravenous antibiotics, oxygen therapy, respiratory therapy, and mostly likely an inhaler to maintain open airways. Yes and no. The bronchial pneumonia disease itself is not contagious, but the bacterial and viral microbes are. By coming into contact with these microorganisms, you may contract a disease but it will not be bronchopneumonia—not in this manner. You can take measures to prevent getting an infection that may develop into bronchial pneumonia. Wash hands thoroughly with soap and warm water. Maintain a healthy diet with plenty of vitamin and mineral-enriched foods. Get adequate sleep each night. Limit, or avoid, alcoholic drinks. Avoid contact with people who are showing signs of illness. Bronchial pneumonia can be a serious condition because it affects the lungs and the bronchial tubes. This is a more severe form of pneumonia that presents similar symptoms but with a higher intensity and broader range. As this infection settles into the bottom portion of the lungs, you can expect symptoms that may require hospitalization, if not complete bedrest. Take precautions to maintain a healthy immune system to prevent contracting respiratory infections that can develop into bronchopneumonia. Is Bronchitis Contagious? How Long Is Bronchitis Contagious For? ‘Bronchopneumonia: Symptoms, Risk Factors, And Treatment,” Healthline; http://www.healthline.com/health/bronchopneumonia#overview1, last accessed July 5, 2017.